Last July, after months of rumors and leaked screenshots, Facebook launched a Q&A product called Questions. At the time, I said it had the potential to be “massive”: with 500 million (now 600 million) users, the site had the chance to take on Q&A sites like Yahoo Answers, which can be a huge source of traffic. And it was also directly taking on Quora, the buzzed-about startup that has a contentious relationship with Facebook, in part because it was founded by former Facebook CTO Adam D’Angelo and engineer/manager Charlie Cheever. But Questions never took off. Facebook has limited access to the product to a small percentage of users, and over the last few months we’ve gotten several tips that the product wasn’t really getting traction. Today comes news that seems to confirm those rumors: Facebook has just announced a revamped version of Questions that has very little in common with the original product. And it’s no longer any threat to Quora. The new version of Questions is less ambitious — you’re no longer directing questions to the entire Facebook community. Instead, it’s much more in line with Facebook’s ‘social’ bread and butter: you ask a question, it shows up as a structured poll in your friends’ News Feeds, and they can vote on the various answer choices or add a new one of their own. In fact, my first reaction to the product was that it might be more appropriate to call it ‘Facebook Polls’. So, as an example, I might ask my friends what their favorite restaurant in San Francisco is. I might pre-populate it with choices like “In-N-Out Burger” and “Tony’s Pizza” — which my friends could vote on — but if someone wanted to add a recommendation that wasn’t already listed they could. Whenever one of my friends votes in one of these questions, my question then shows up in the News Feeds of their friends. In other words, the questions you ask can go viral. The responses from your friends will always be highlighted (you’ll see their faces as small thumbnails) but if you ask a question that resonates with a lot of people, you could wind up with plenty of responses from strangers, too. Unlike the old version of Questions, you can no longer browse by Topic — the only questions you’ll see are the ones that pop up organically in your News Feed (you can also see questions that have been asked by friends, and only friends, in a Dashboard). This is a big change, and it means that Facebook Questions is no longer setting out to become a vast database of knowledge the way Quora is. It just wants to make it easier to get recommendations from your friends. Product Manager Adrian Graham says that the change reflects the way people were using the original version of Questions. Oftentimes people would ask things that they were mostly directly toward friends (What movie should I watch?, What’s your favorite restaurant?, and so on). But then strangers would respond with lengthy answers, which would intimidate the user’s friends to the point that they might not respond at all. The new version looks to lower this friction by emphasizing polls. Facebook seems more confident this will take off with users. 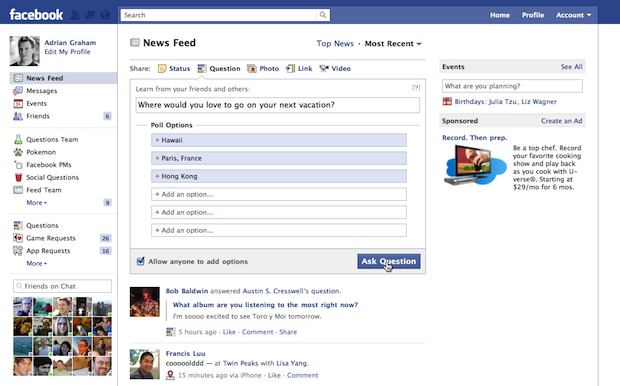 Unlike the old version of Questions, which never saw a broad rollout, Facebook will be more aggressively deploying this. 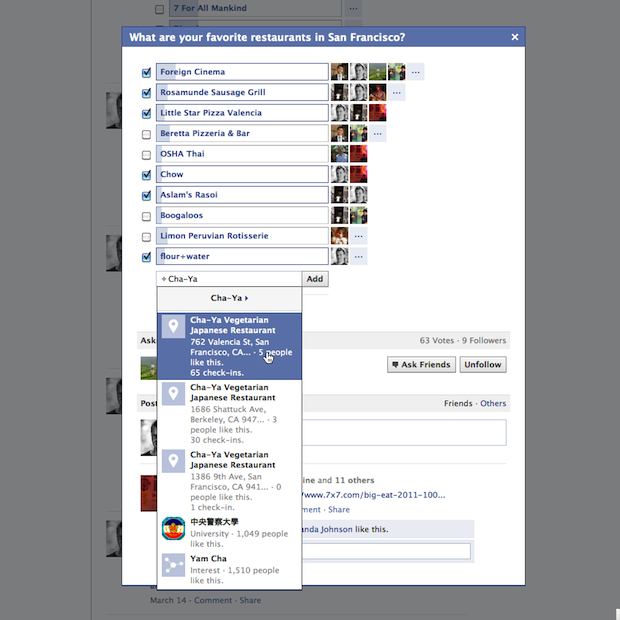 It’s also letting anyone who wants immediate access opt-in now by going to Facebook.com/questions.